Lancaster, Pa. — When the Lehigh Valley Charter High School for the Arts in Bethlehem, Pa., was looking for a location to build their new school, they knew the southern end of the city — which is the heart of Bethlehem’s art, cultural and entertainment district — would be the ideal spot. And once the school’s site location and design were confirmed, it was determined that precast concrete would be ideal material to use for construction. 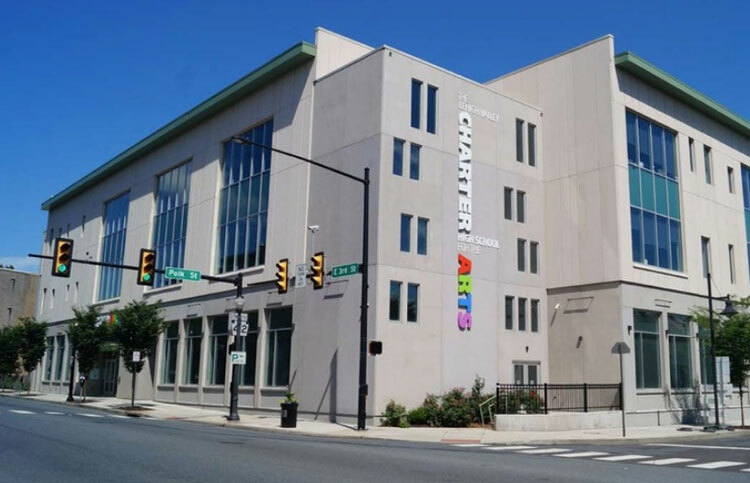 The Lehigh Valley Charter High School for the Arts is a public charter school that is fully accredited by the Pennsylvania Department of Education and The Middle States Association of Colleges and Schools. It first opened in 2003 and currently enrolls 600 students in grades 9-12. The school enables students from a broad geographic area to maximize their special talents while also gaining a quality high school education. Seven areas of curriculum are offered including Dance, Literary Arts, Visual Art, Figure Skating, Theatre, Instrumental Music and Vocal Music. With growing enrollment, the school needed a much larger space that would accommodate more students and deliver an enriching arts education experience. They found the perfect site in South Bethlehem, and precast concrete was determined to be the perfect construction material based on site location, project schedule, and desired aesthetic look for the building. The project owner, Charter Arts Foundation, selected Nitterhouse Concrete Products as the precaster. Nitterhouse is a producer member of PCI Mid-Atlantic, a chapter of the Precast/Prestressed Concrete Institute. There were three key challenges for the project – a tight construction space in a downtown location; a production timeline that took place over harsh winter months; and an aggressive schedule that required work to be done by the first day of school in August. Using total precast construction material not only addressed all three challenges, but also allowed for increased space versatility and a unique aesthetic look that fit well with surrounding city buildings. The new school building offers traditional classrooms as well as spaces designed for the school’s strong art programs. These spaces include a 370-seat theatre and green rooms, rehearsal studios for dance and music, a digital laboratory, rooftop lounge/rehearsal/performance area, and art galleries. The unique total precast construction allows the students’ artwork to be more prominent at the forefront of their galleries. The building also offers an outdoor learning space where students can have a class or study in a safe, unique urban environment. The second-floor precast outdoor area includes 225 square feet of planted raised beds that qualifies as green space for LEED. Since its doors opened, the 83,000 square foot three-story school has been hugely successful in achieving its mission of providing a unique, integrative educational experience that fosters the development of talent in the arts.